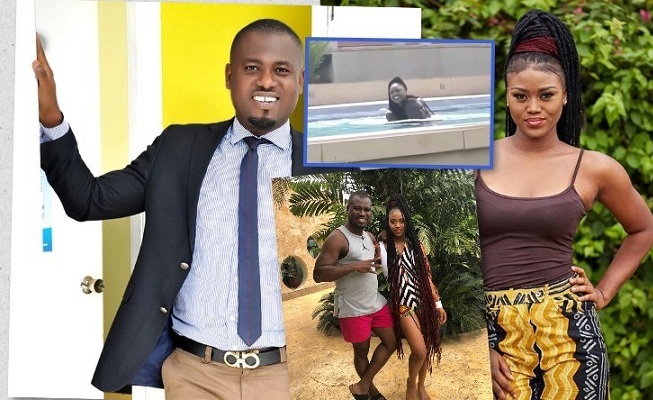 Popular Ghanaian Broadcast Journalist Abeiku Santana has been caught with songstress eShun in a swimming pool at a coded location. In the one-minute video, Abeiku Santana and eShun were seen together in the swimming pool and perhaps swimming together. From the video, Abeiku Santana at a point in time even carried eShun at his back like a nursing mother carrying her baby. Well, for some time now, top radio presenter, Abeiku Santana has proved that he has lo ve for ‘small girls’. The has been caught up in scandals of sliding into the DM of Slay Queens on social media. The OKAY FM Presenter in recent times has made news headlines on controversial grounds. A vivid example is when it emerged that he edited some portions of an interview he had with Joselyn Dumas to make it look she stated that she dated the actor John Dumelo.